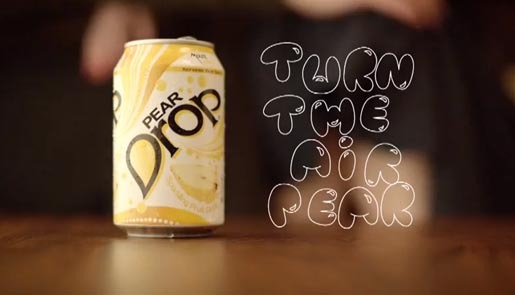 “Turn the air pear.” That’s the tagline for the new Pear Drop drink recently launched in the UK with online videos, a Peardrop Drinks Facebook page and DropDrinks YouTube channel. Two bizarre clips, Barrel and Date, demonstrate the fragrant power of the drink through the medium of burping. The drink is the latest product from Mount Valley Drop Drinks, based on the flavour of Peardrop boiled sweets, the first of many new flavours. The Turn the Air Pear campaign was developed at JWT London by executive creative director Russell Ramsey, copywriter James Humphreys, art director Craig Hunt, agency producers Emma Hovel and Rosie Evatt. Filming was shot by director Austen Humphries via Rattling Stick, London. Sound was produced at 750mph by Sam Ashwell. Editor was Richard Orrick at Work Post.